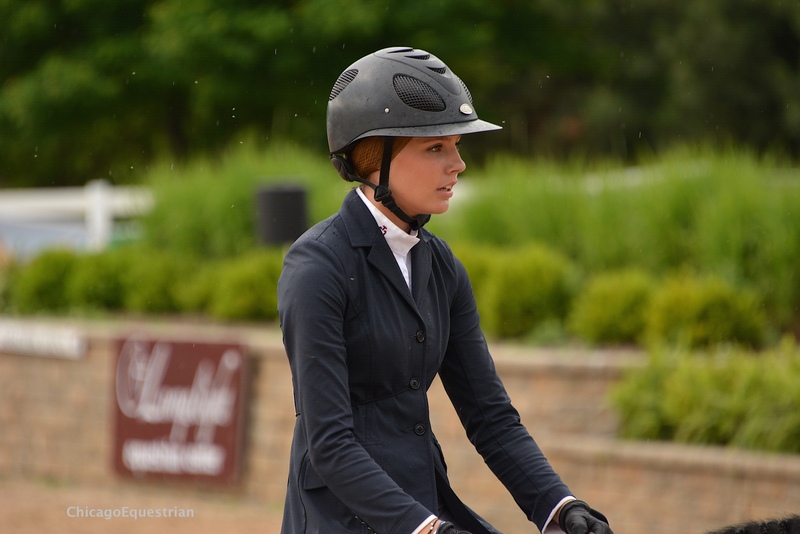 Giavanna Rinaldi moved up each round to win the Showplace Equitation Challenge. 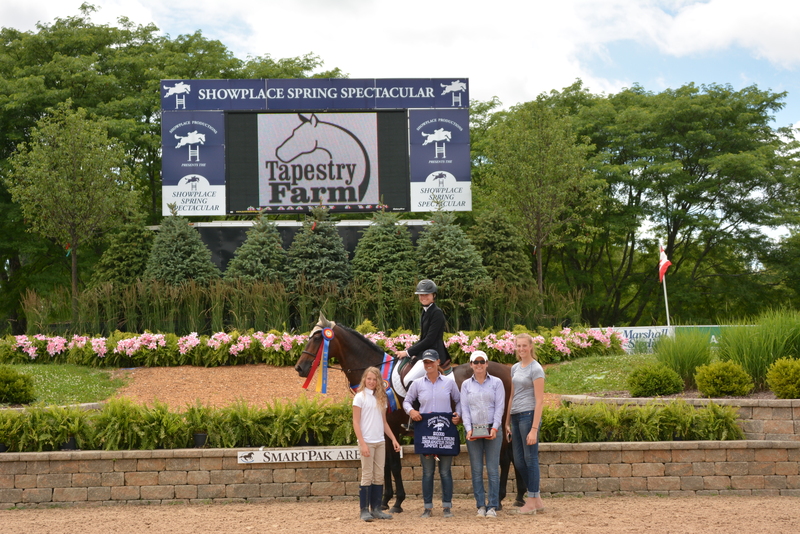 June 26, 2016- Wayne, IL- The final day of competition at Showplace Productions’ Spring Spectacular began with the Showplace Equitation Championship, presented by Kim Gardiner and Perfecta Farm. 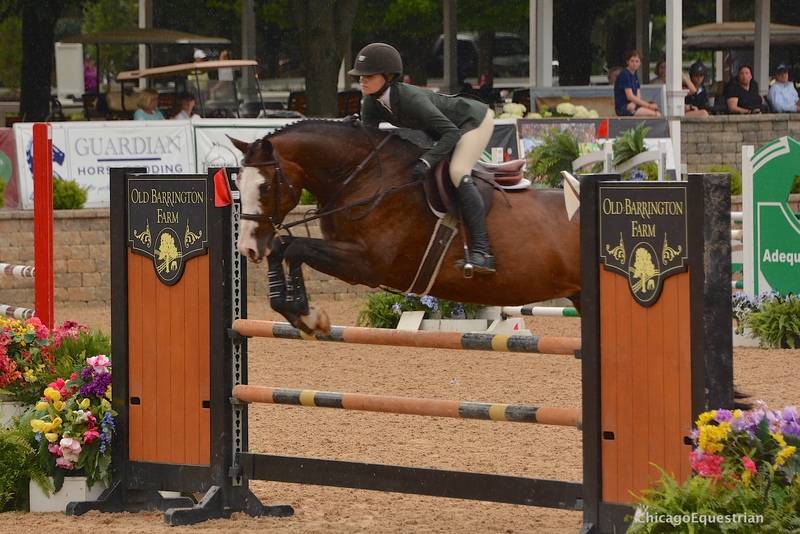 The Equitation Challenge was a culmination of the past three-week’s top six placing junior riders in the ASPCA Maclay, USEF Talent Search, USEF/Pessoa Hunt Seat Medal, and the Washington Hunter and Jumper Phase. After three rounds and three different leaders, the top honors went to Giavanna Rinaldi aboard Fendi. 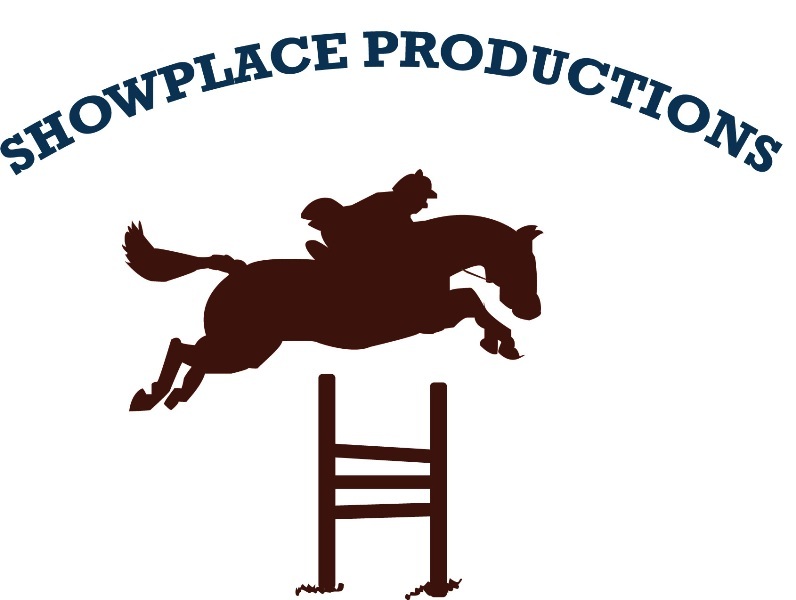 The Challenge was created three years ago by Showplace Productions’ show manager, Patrick Boyle, with the hope of helping riders evaluate their skills, gain confidence and prepare for medal finals. 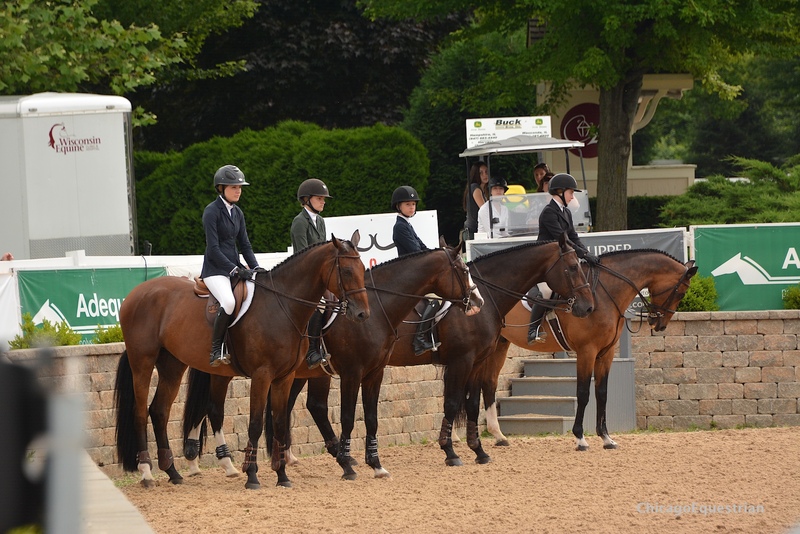 Based on the George H. Morris Excellence in Equitation Championship hosted at the Winter Equestrian Festival, Boyle’s version follows the same format. “It’s formulated off the George Morris class they do in Wellington and other areas. It’s a great opportunity for kids to do their own thing, train themselves, take the pressure upon themselves and make their own decisions,“ said Boyle. Riders started with a meeting with Pat Boyle to revue the class format and rules. Boyle’s daughter, Caitlin, won the inaugural Challenge in 2014 before heading to the medal finals. Boyle hopes riders view the challenge as a stepping-stone to further their careers. “I hope the riders take away confidence in their own abilities and what they can do. They also get to figure out where they’re lacking, where they need more help and where they need more training, I think it just shows them what level they’re at compared to where they’re getting ready to go, which is to indoors in the fall- Harrisburg and Kentucky. It gives them a feeling as to where they might be skill wise and also what they need to keep working towards,” explained Boyle. 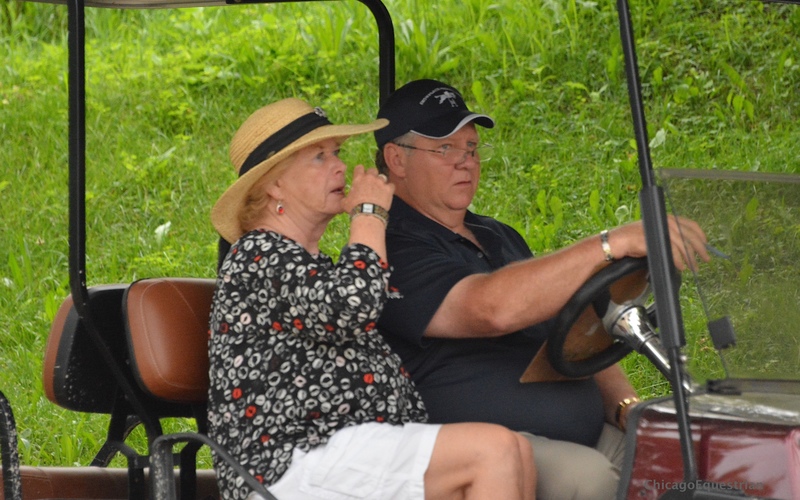 Pat Boyle and Diane Braun were the schooling ring judges. Boyle also served as a schooling judge with steward Diane Braun. 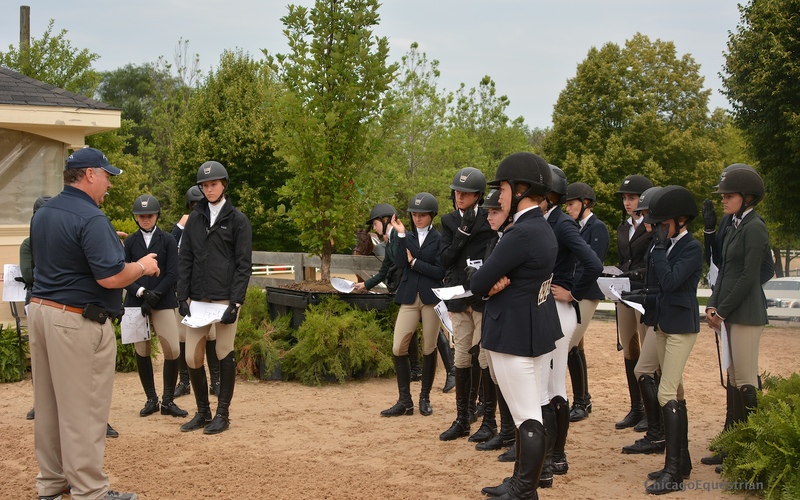 Riders had the ability to earn points toward their overall score by following proper schooling rules as defined by the USEF rulebook. 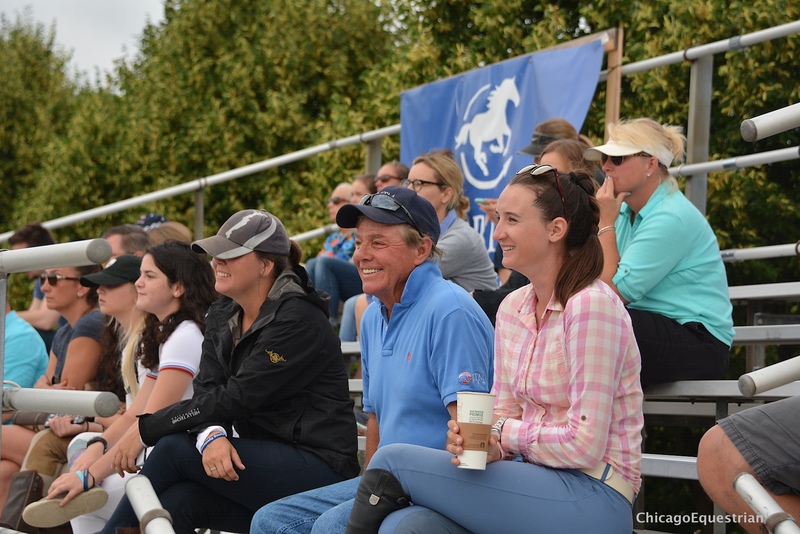 “What we look for is how they prepare their horse, if they’re on in time, if they’re properly dressed, if everything’s appointed well and if they do a really good warm-up. Each horse is different so they each have their own style, we look and see how they prepare their horse with no one guiding them. Do they know if the oxers are square or offset? Are the jumps set properly? How do they get themselves prepared to perform the best by the time they walk up to the ring?” said Boyle. Natalie Jayne, the youngest competitor in the class, took the lead after round one. 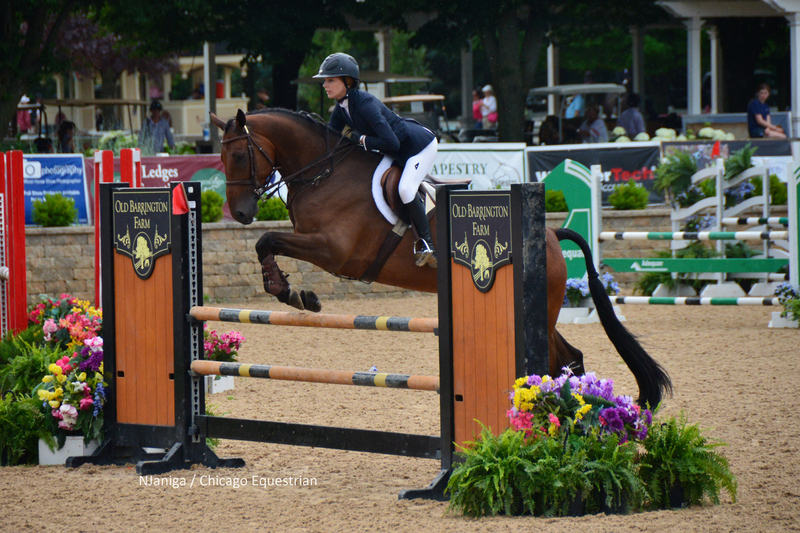 After the first round of competition, 11-year-old Natalie Jayne of Elgin, Illinois, lead the class of 19 competitors after the first round with a total score of 88 picking up 2 points in the schooling ring. Following Jayne was 18- year-old Claire McKean of Woodlands, Texas, who was second with a score of 86 also picking up 2 points in the schooling ring. Giavanna Rinaldi sat in third after the first round with an 84 and Cole Battershall rounded out the top four after round one with a score of 81. After round two, which was a new course, McKean lead the group, scoring a 92, the highest score of the class, raising her total to 178. Rinaldi moved up to second with a score of 88 for a total of 172, while Jayne ended up third with an 83 for a total 171. Regan Rast made a huge jump in the order, moving out of seventh place to join the top four with a score of 81 and a total of 159. Claire McKean took the lead after round two. The top four were then called back for final testing. Finalists had to face the outside of the ring so they could not see what their competitors' tracks were. Riders jumped a shortened course showing their handiness. Rast rode a smooth test with wider hunter type turns and Jayne chose to turn left after jump five, which worked out well for her but was not as handy as the right hand turn. Rinaldi demonstrated smooth, tidy turns, clearly showing her jumper ring mileage for a very handy round. McKean was last to go and made a tight turn to the combination, which caused her horse to lose impulsion and he had to work hard to get out, with McKean losing her position, causing the pair to lose their steady rhythm in the next turn. The final four, Claire McKean, Gia Rinaldi, Natalie Jayne and Reagan Rast, listen to the test. After the test phase, it was seventeen-year-old Rinaldi, Wayne, Illinois, who moved up again for the win. Rinaldi was second in the 2015 Challenge and aimed to return for the win this year. 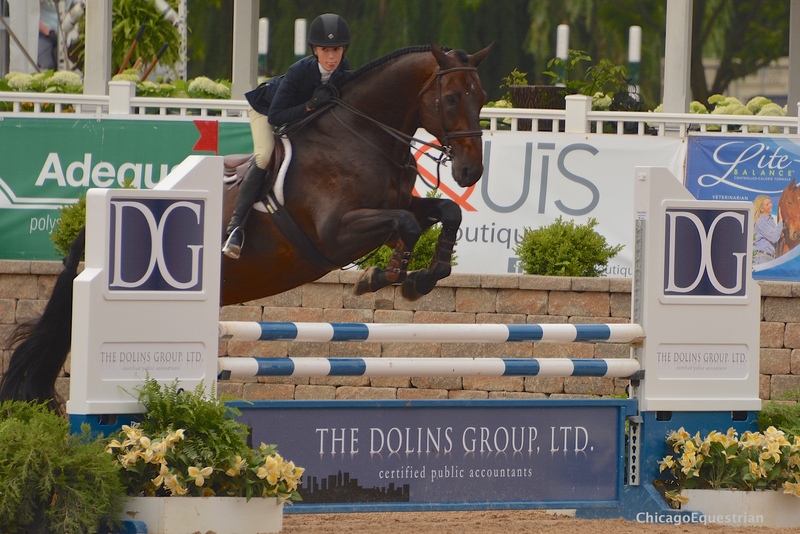 She rides with Alex Jayne’s Our Day Farm and just came off a spectacular winter season at WEF, where she was 7th overall in the George Morris Equitation Championship, the class this class is modeled after. Her mount, Fendi, shows in the junior hunters and jumpers as well. Rinaldi is already qualified for the all of the medal finals this year. Giavanna Rinaldi and Fendi proved to be the winners. “I didn’t love my ride to the plank in the first round, I got too deep and he tried but I was really happy with second round, I thought it rode smoothly,” said Rinaldi. McKean is already qualified for all of the medal finals and added it was nice to do something different. Trainers got to watch from the stands. Jayne, the youngest rider in the class, is a regular competitor in the pony ring but also rides horses in the hunter divisions and can be seen in the jumper ring as well. Her mother, trainer Lynn Jayne, along with Patricia Griffith of Heritage Farm, oversee her program. Jayne will have rides this year for the Pony Finals plus her equitation goal is to ride in the Taylor Harris Medal Finals this year, since she has nine more years as a junior rider to get to the major medal finals. Coming back after the first round in the top spot did not faze Jayne at all. Rebecca Kozma accepts the Monica Fowler award from Kim Gardiner. 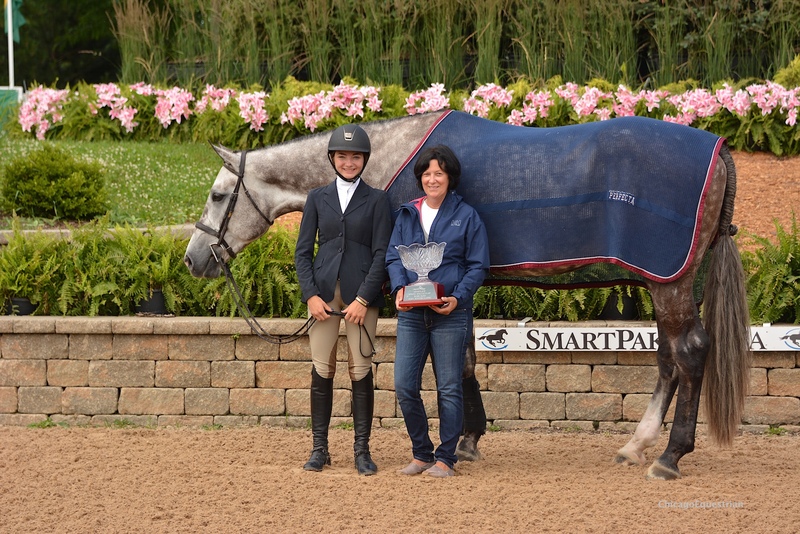 Rebecca Kozma, who placed fifth in this year’s Championship final, was awarded the Monica Fowler Memorial Perpetual Equitation trophy, which is awarded to the top placing equitation rider during the three weeks and is sponsored by Canterbury Farm. Kozma was Champion in the 15-17 Equitation two out of three weeks and Reserve Champion during the first week of the show series. As Boyle said, the riders now have an idea of what they need to work on for the summer before the fall medal finals and the class is a fun addition to the Showplace Spring Spectacular series. 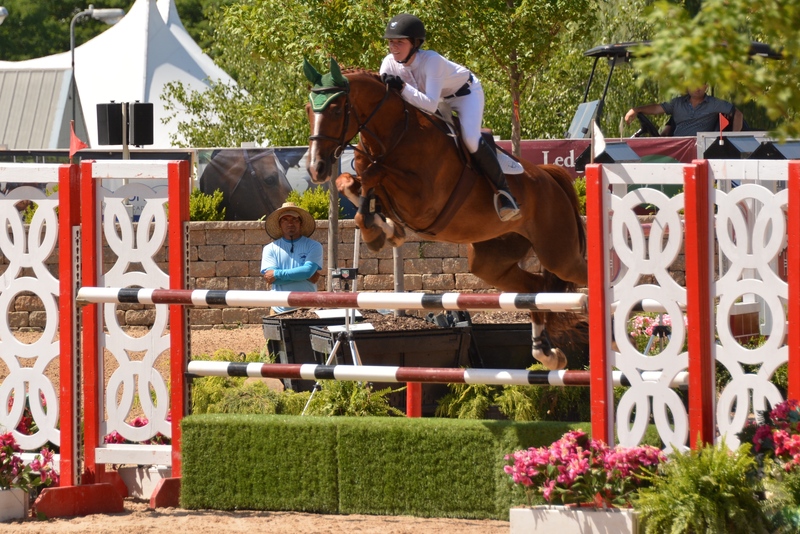 In the $10,000 NAL/M&S Low Junior/AO Jumper Classic, presented by Tapestry Farm, Paige Matthies and Peninsula Emerald Lass took the top prize with a double clear round and speedy time of 33.596. Paige Matthies and Peninsula Emerald Lass with trainer Melissa Hirt. Taking second was Amanda Seale on VDL Endorado Ryal K with a time of 36.962. Out of 38 rides, only 3 were double clean on a tricky course, causing numerous four and eight fault rounds. Winner Caelinn Leahy and Esquilino Bay.